Wide spreading tree with fine fern-like leaves on an open branched graceful tree. 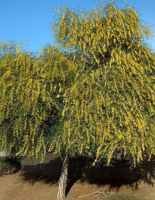 The sap of the tree is used to treat a number of ailments including cuts and wounds. Hardy to 10F (-12.2C); height: 40ft. 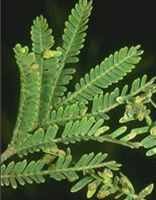 Native to Australia and New South Wales, this acacia forms a medium sized tree with fern-like leaves. The sap is used as a substitute for gum arabic and the bark is astringent. 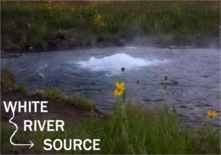 Hardy to 10F (-17.7C); height: 40ft. The scented flowers of this Australian native are used in cooking and the hard finely grained wood is often used to make furniture. Hardy to 20F (-12.2C); height: 90ft. 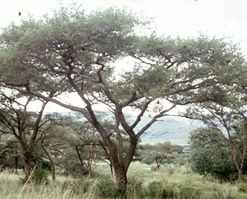 Flat topped acacia with fern-like leaves with thorns at the base and fine yellow hairs on leaves and branches. The seed pods are often used as livestock feed. Blooms are creamy white. Hardy to 20F (-12.2C); height: 90ft.